YouTube has in many ways and for many people replaced the TV as their source of video content; with over a billion users (that’s a one with nine zeros after it), which equates to 1/3 of all people on the internet, YouTube is one of the top three most popular sites on the net, surpassed only by Facebook and Google. Literally billions of page views on YouTube and hundreds of millions of hours of video watched every single day. It may be needless to say at this point that if you want to reach an audience, YouTube is a great place to do that. Video ads are the best way of advertising on YouTube, similar to TV adverts you can get your brand in front of an almost endless audience. 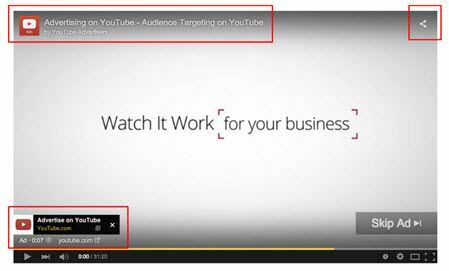 Video ads are also referred to as ‘TrueView Ads’ and ‘YouTube Ads’, primarily because ‘video ads’ of this kind are only available on YouTube. TrueView ads also appear on websites throughout the GDN (Google Display Network) through embedded YouTube videos. If you have used YouTube, you have likely seen TrueView ads as they are the video ads that appear before some videos play, typically you can skip them ads after 5 seconds if you are not interested. 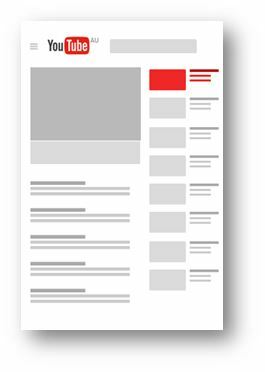 This is one of two formats that TrueView ads come in, we cover both in more depth later in this guide. These ads strike a great compromise between advertisers and those being advertised to… The advertiser only pays for actual views of the ad and because the viewer can skip ads, the chance of the view being relevant and targeted is much higher. Because the view can skip the ad if it’s not relevant, they are not wasting time watching irrelevant ads. Video ads are a very different ad than your standard search network text ad, they typically are less direct response focused and bidding is done per view rather than per click or per impression. Receiving an impression is to some extent just a potential impression, in that the ad is on the page a user is viewing but it’s not guaranteed that they saw it. A view, although still not a guarantee, is much more likely to have been viewed by the user. Consequently, there are a suite of metrics associated with video ads that we cover later in this guide and each one in depth in other guides. You can use videos in ads but if you want to do this through the display network as you would with image or text ads, you will need to learn about Lightbox ads or Rich Media ads. People advertise on YouTube for a range of reasons, for some businesses this may not be either practical or relevant depending on a number of factors. YouTube channels that generate money through the Google Partner Program may want to reach relevant audiences and expand their subscriber base. Whereas an online business may want to both promote their channel, increase video views and increase brand awareness. In all cases you will be targeting a relevant and more engaged audience with your ads. If you cannot afford to advertise on TV, YouTube is somewhere between the next best thing and the best thing! TV is very expensive and is also hard to accurately measure, in terms of both viewers and engagement. YouTube has hundreds of millions of users each day, from all over the world. Although not everyone will watch your full video ad, you are only paying for those that do (or those that engage with it). Thus the majority of the views your ad receives will be from a more qualified audience. Video is typically a more engaging medium as is demonstrated in most stats available on video vs text based content. It’s both quicker and easier to convey your message and as such is easier for people to engage with. Unlike TV advertising, TrueView offers very detailed reporting and metrics with which to measure success, report and also optimise for improved performance. This is all viewable within AdWords Online, we describe in more detail the metrics later in this guide. The volume of users on YouTube and the low cost of reaching them facilitates powerful branding campaigns that can increase brand awareness within broad or more targeted audiences. Many YouTube users also use both Google and Facebook, in conjunction with sites on the GDN (Google Display Network) … YouTube provide not only an additional channel to increase brand awareness but also a unique and powerful format to do so in. Video is by far the best medium for branding, being able to use sound and visuals to create a strong look and feel. Videos allow you to convey messages and information quickly and easily, use them to deliver a message about your brand, business, products, services, promotions, etc. Although campaigns can generate traffic, TrueView video ads are more targeted towards generating views and YouTube channel engagement rather than delivering traffic to a website. You can encourage clicks that result in traffic and some campaigns will be better at doing this than others. As a consequence of the above statement, YouTube Clicks can be scarce often making it not a great direct ROI channel for many advertisers. However, there are of course significant benefits from driving brand awareness within a target audience, which can be asses in more advanced cross channel attribution models. Although the process of setting up video ads within AdWords and YouTube is pretty easy, the cost or difficulty of producing high quality promotional videos can be prohibitive for many businesses. Combined with typically low direct ROI, this can make YouTube advertising unattractive for some. We mentioned previously that there are two formats for TrueView ads, we describe each below in more detail. 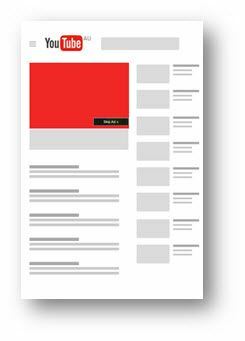 In-stream ads can appear both on YouTube Watch pages and other sites such as video publisher pages that are on the Google Display Network. You are not charged if more than one of the above items occurs from the same user, so you will not be charged for both a 30 second view and a click. The cost of all of the above are also the same, you will simply charge if any of them occur; if none of the above criteria are met, you will not be charged. 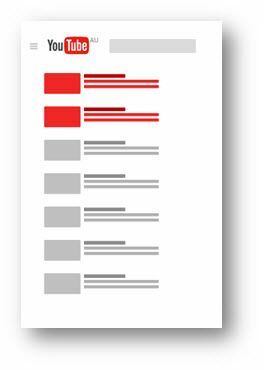 In the image below, only those areas highlighted in red are clickable links / call to actions that will result in being charged. This changed from when clicking anywhere on the video would incur a charge. Now, clicking the ad will pause the video. These are preview images with a description and headline and are marked as sponsored listings for the user. You are only charged when a user clicks on your ad preview allowing them to see your ad. It is also worth noting that you cannot have an ad group containing both ad formats, ad groups can contain only one ad format. This means you will have in-stream ad groups and in-display ad groups. 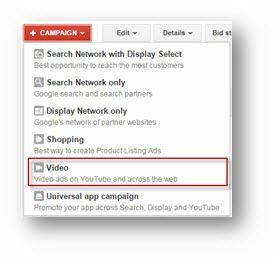 If you have linked your AdWords account with your Google Merchant Centre account (in addition to the YouTube account), you will be able to use ‘Shopping Cards’ as interactive extensions to your video ads. We describe these later in more detail. TrueView Shopping campaigns can use remarketing lists and other targeting methods to reach your target audience. This is the YouTube URL of the video you wish to use as the video ad, use the full URL of the video. The display URL has to contain the domain of the website to which the ad is delivering traffic and the domain used in the Final URL. This should be simple and easy to read, avoid using prefixes such as http:// or https:// as well as www. We avoid using prefixes because of the maximum character length is capped at 35 characters. For websites with domain names longer than 35 characters the Display URL will be shortened / truncated in the search results. 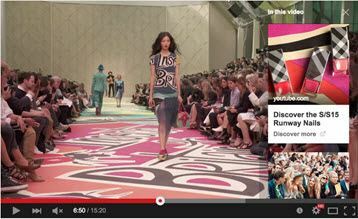 Display URLs for in-stream ads are shown in the lower left hand corner of the screen of the video ad. Display URLs for in-display ads are shown as an overlay on mouse-over (this is when someone moves their mouse over the video). This is the URL of the landing page that a user will reach after clicking your ad. This is not visible to users before they click on an ad, after a click they will be able to see this in the address bar of their Internet browser. The Final URL replaces the ‘destination URL’, which has been used historically for many years. This feature is new and came out with the release of Final URLs. This uses ValueTrack parameters, which are similar to URL Parameters, and they allow you to collect information about the user such as the device type they are using when they clicked one of your ads. This works specifically with GA (Google Analytics) and parses information to GA.
ValueTrack parameters can be set up at any level (account, campaigns, ad groups, keyword, ad) and can be implemented in AdWords Editor under the ‘URL Options’ tab. We discuss Tracking Templates and ValueTrack parameters in more detail in another article. These are an advanced versions of URL parameters where you can define what values are recorded one someone clicks your ad. We discuss Custom parameters in more detail in another article. Labels are a simple way of tagging ads with relevant information, for example you could add the label “blue dresses” to all ads that advertise blue dresses. Equally you could add labels that describe anything about the ad, this can be filtered in AdWords (using filters) or once exported into a spreadsheet you can use these for SUMIF, VLOOKUP, COUNTIF formulas, etc. Essentially providing customisable segmentation criteria for your ads. AdWords already provides functionality to filter ads by network, device, and criteria such as minimum Clicks or Conversions, so labels are only relevant when adding another criterion with which to filter or segment data. This component is where you can name the ad; we recommend a consistent naming convention that includes ad dimensions, date created and any other relevant information such as product type. This will make ad management easier and more efficient in the long run. Although this has no impact on ad performance, you can make your life easier by naming your ads something both logical and consistent in nature. An ad group can contain only one type of ad format. You can add interactive components to your ads to enhance them, any user interaction will count as a chargeable action equivalent to a click, 30 second view or a full duration view. TrueView for shopping campaigns, which we described earlier in this guide, allow you to use shopping cards. Shopping cards can pull product information from your Google Merchant Centre account into clickable links to these products. This connects users with your products more directly and promotes click through. The image below shows how a card can be utilised well to highlight products / features within the video ad. 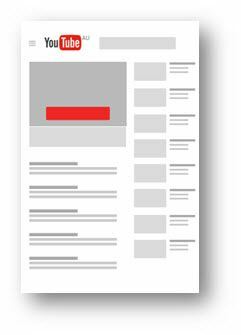 Overlays are clickable opaque boxes that you position over an ad that can link to your website. These are good for helping to drive traffic to your site. Also consider analysing data to see where you have high and low performance. Exclude or down bid low performing areas and split out, up bid or increase spend in areas where performance is good. The areas will depend on how you target your audience, whether through topics, interests, demographics, etc. 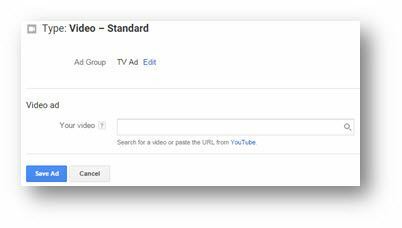 We cover each of the metrics used specifically for Videos in the AdWords metrics guides listed below. This refers to YouTube ads only and is represented by a whole number. With TrueView accounts, each video ad view counts towards your public YouTube view count. Read more about Views. Represented as a percentage (%) and provides a good indication of your video’s popularity with the target audience. Calculate by dividing the Views by the Impressions. Read more about View Rate. This is the maximum you are prepared to pay per view, essentially the bid or equivalent of CPC (Cost per Click). Read more about CPV. The percentages (25%, 50%, 75%, 100%) are triggered once a viewer watches at least 25% of a video (or 50% or 75% or 100%). So for example if someone watched 32% of a video they will fall into the 25% category, or if someone watches 60% of a video they will fall into the 50% category. The number of users that saw the ad or ad thumbnail for any duration. Read more about Impressions. The number of people who clicked a CTA linking to your website. Read more about Clicks. Clicks divided by impressions, the rate at which users click through to your website from a video ad. Read more about CTR. Read more about Earned Views.